From construction companies, to financial trading firms to amusement parks, 2016 saw many companies, big and small, struggling to stay afloat. SÃO PAULO, BRAZIL – The number of companies in Brazil seeking judicial recovery in 2016 set a record according to data released by Serasa Experian, a credit and business research company. In all 1,770 companies that sought bankruptcy protection through judicial recovery plans, the highest number since the consultancy started the survey, in 2005. One of Brazil’s largest telecom carriers, Oi, filed for judicial recovery in 2016, photo by Gildemax/Wikipedia Creative Commons License. “The deepening of the economic recession in 2016 has significantly affected household consumption, both through rising unemployment and rising credit. Thus, retail trade was the economic sector that ended up suffering more intensely the decline in consumption, causing financial difficulties for companies in this sector,” stated the Serasa report. In comparison with 2015, judicial recovery requests from the retail trade segment increased by 51.2 percent, while the services sector increased by 48.5 percent and, requests for judicial recovery in industry rose by 24.2 percent. Unlike bankruptcy, judicial recovery is a court-approved rehabilitation procedure, whose main purpose is to preserve the company, by extending debt re-payment, selling off assets and renegotiating wages. From construction companies, to financial trading firms to amusement parks, 2016 saw many companies, big and small, struggling to stay afloat. 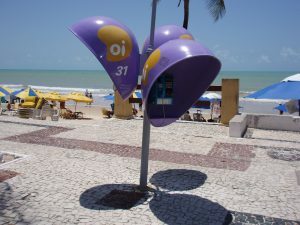 In June of 2016, one of Brazil’s largest telephone carriers, Oi, filed what is considered the largest judicial recovery request in the after restructuring talks with major shareholders failed. The company registered debts totaling R$65.4 billion. The latest survey by Serasa also shows an increase in the number of bankruptcy filings last year compared to 2015. According to the consultancy there were 1,846 requests in 2016 compared to 1,760 the previous year. The service sector led bankruptcy filings with 746 cases followed by industry with 676, and retail trade, with 424 requests.